Patching your Business Objects XI Enterprise system can be a daunting and confusing endeavor. I hope that this little article can help dispel some of the confusion surrounding the topic. 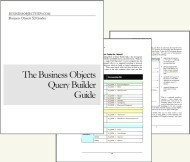 Base: This is the full install of the base version of the Business Objects Enterprise product. For example, the installation package for Business Objects XI 3.1, without any patches included. Patch: This is a generic word used to describe any install package that is not the base install package. It may be used to describe full install packages which are occasionally created for Service Packs. Service Pack: These are large groupings of bug fixes that may also include some new functionality of performance enhancements. Usually a new Service Pack (SP) is released once the current version reaches a Fix Pack level around X.5 and they seem to be released every 8 – 14 months (depending on the stability of the release). SP are numbered, such as SP1, SP2, SP3, etc. Fix Pack or FixPack: These are smaller groupings bug fixes that are released every few months or so. FixPacks (FP) are associated with particular Service Packs and therefore any given FP can only installed against the SP for which it was released. Fix Packs are numbered after the decimal and share their parent ServicePack’s number before the decimal. For example, FP 2.6 is the 6th FixPack released against Service Pack 2. Limited Availability Fix or LA Fix: This is the lowest level of patch. These are usually obtained by large customers of SAP Business Objects or by customers who pay a premium to obtain a fix for a single bug. LA Fixes are used by BO customers to fix bugs either as soon as possible without having to wait for the fixes inclusion in a Fix Pack or, in special cases, they may fix a bug that is also fixed in a FP or SP, but the BO customer can’t install the FP or SP due to some restriction on the customer’s side. PLEASE NOTE, LA Fixes do not go through the strenuous QA testing cycles that are applied to FP and SP. LA Fixes often do not come with an installer, but rather they are a few binaries and some instructions on how to “install” these binaries. It should be noted that LA Fixes are made to be applied only to a certain patch level (that of the requesting customer). This means that once an LA Fix is installed, an administrator should not install any patches until it receives confirmation that the bug which the LA Fix corrects has been fixed in desired patch. One can expect that new bug fixes released through LA Fix, may not be included in the next fix pack to be released, or possibly not even in the FP after that. This will depend on the severity and priority assigned to the bug. ADAPT: Business Objects tracks their bugs through “ADAPTs”. The following describes the birth of an ADAPT: Customers or BO personnel bring a bug to BO support. The issue gets escalated through support and through a technical escalation. Passing these, the bug is verified and an ADAPT is initiated to track that bug and pass it on to the product development teams who will determine its priority and eventually its inclusion in planned FP and/or SP. MHF or CHF: These are old acronyms and terms (monthly hot fix and critical hot fix) that were used prior to BO XI. They more or less correlate with FixPacks. The following are a few interesting aspects of Business Objects Enterprise patches. Usually when at about the fifth Fix Pack associated with the current Service Pack the next service pack is released. If you are keeping current with patches this is a good time to move to the new SP. All future FP released on the old SP will continue to fix newly reported bugs, but upgrading to the next SP will give you some scary errors if you install these FP’s. My best recommendation is to jump to the newest SP once it has its first FP. Let others discover the bugs and suffer the pain for you. Most patches are incremental, meaning that they require that you install the preceding level of the product. For example, incremental Service Packs will require the installation of the base version, Fix Packs require that you install their associated Service Pack. Full installs are patches that do not require the installation of the base version or any other patches. They are standalone Service Pack patches. These are usually large in size, but smaller than the sum of the incremental patches that would get you to the same level. It is recommended by most admins and by SAP Business Objects that one should always install the highest available full install, and one should not install the base version with incremental patches when a full, standalone patch install is available. By leveraging the full install one can expect a cleaner install directory, with a lighter foot print. Full Standalone Service Pack Installs are not released with each new SP. In Business Objects XI R2 full installs were made available on even-numbered Service Packs, such as SP2 and SP4 (it should be noted that SP6 was an incremental upgrade). For XI 3.1 it appears that full installs will be released on odd-numbered Service Packs (SP3 has a full install, but I don’t recall one for SP1). Patches will write a large number of “backup” files to the “/setup/backup” folder. Since these folders are located in the same parent folder as “bobje” one must take care that they do not “steal” away too much free disk space from your Business Objects application. By the way, these files are only used to uninstall patches and therefore they can be relocated if necessary. All BO XI 3.X patches require that you first install the patch on a single CMS machine (running only CMS and Input/Output FRS, with all other machines in the cluster NOT running their BO servers), and then after this a successful installation one can proceed to install the patch on all other machines in the cluster. Therefore your total patching time will be at a minimum the time it take to install on a CMS machine plus the longest duration taken to install on the rest of the machines. Language Packs can lengthen the duration of base and patch installation considerably. Choose your language packs carefully as they will lengthen your downtime for patching in the future. For example, make sure your user(s) will actually make use of the Finnish language pack before you just decide to throw it in to be safe. Everything has a cost. There is no such thing as a free lunch. Also, please note, that new language packs may be made available with new Service Packs; however, you may need to take special steps to be able to install these as language pack selections are often only done with full installations. In a multi-machine cluster plan out which servers will take which roles. If, for example, a machine/box will always only run WebI Processing Servers and nothing else, there is no need to install CMS, Crystal, FRS, DeskI, etc. on the server. By limiting the installation you can expect future patching and initial installation to run more quickly. A huge oversight is to forget to patch your Windows client tools. Do not make the mistake of failing to patch your Designer, Import Wizard, Desktop Intelligence, and WebI Rich Client applications. BO does not always stop lower patch version of client tools from connecting to higher patch level BO systems, but the ramifications of such uses could be quite severe. DO NOT FORGET to patch your administrative client tools and have your users install the patches as well. If you have any comments, questions, or thoughts to share on this topic please do so below. Can we skip older versin FP? Say we skip FP4.1 by installing FP4.2 directly. Thank you so much Julian. Your site is very helpful. We are on BOXI3.1 and we got orders to upgrade to sp6. We are using SAP as a data source. Could you please let us know the process to follow/install the SP and any changes to be made on the server while installing. Provide the document if any. We are using BO 3.1 and planning to apply service pack 7 . This is the first time I am taking this task..please let me what are the prerequisites I need to check. We are using BO 3.1 and planning to play service pack 7 on the environments.please let me know the process of installation..